Pune (Maharashtra) [India], Jan 6 (ANI): Indian tennis pair of Rohan Bopanna and Divij Sharan overcame the British duo of Luke Bambridge and Jonny O'Mara to clinch the ATP tour title in men's doubles event at the Maharashtra Open. New Delhi [India], Dec 31 (ANI): Asian Games gold medal winning pair of Rohan Bopanna and Divij Sharan have been selected for the Davis Cup, scheduled for February 1-2 at the South Club in Kolkata. Paris [France], Oct 31 (ANI): Indian-French duo of Rohan Bopanna and Edouard Roger-Vasselin cruised into the pre-quarters round of the ongoing Paris Masters after defeating Dutch pair of Matwe Middelkoop and Robin Haase in the men's doubles event here on Wednesday. Bengaluru [Karnataka], August 28 (ANI): Karnataka Deputy Chief Minister G. Parameshwara on Tuesday announced that Asian Games silver medalist Usha Rani, who had joined the police services as a constable, would be elevated to 'B' grade post. Jakarta [Indonesia], August 24 (ANI): India on Friday bagged their sixth gold medal in the ongoing 18th edition of the Asian Games after Rohan Bopanna and Divij Sharan finished top on the podium in Tennis Men's Double event. Jakarta [Indonesia], August 23 (ANI): Indian tennis player, Ankita Raina on Thursday won a bronze medal after losing to Shuai Zhang of China in women's singles event semi-final at the ongoing 18th edition of the Asian Games. Jakarta [Indonesia], Aug 22 (ANI): Rahi Sarnobat, who became the first female Indian shooter to win a gold medal at the Asian Games on Wednesday, stated that good application of her strategy helped her clinch the top spot. Jakarta [Indonesia], August 22 (ANI): Indian shooter Rahi Sarnobat on Wednesday bagged a gold medal in women's 25m Pistol Event at the ongoing 18th edition of Asian Games. Paris [France], Jun 5 (ANI): Indian tennis ace Rohan Bopanna and his French partner Edouard Roger-Vasselin will look to secure their place in the semi-finals of the French Open when they play their last-eight clash of the men's doubles event here on Tuesday. New Delhi [India], Jun 4 (ANI): Leander Paes has returned to the Indian tennis squad while Rohan Bopanna has also been named for the upcoming 18th Asian Games. Paris [France], June 1 (ANI): Indian tennis ace Rohan Bopanna and his Hungarian partner Timea Babos will look to seal a pre-quarterfinal berth in the ongoing French Open when they play their last-32 clash of the mixed doubles event here on Friday. 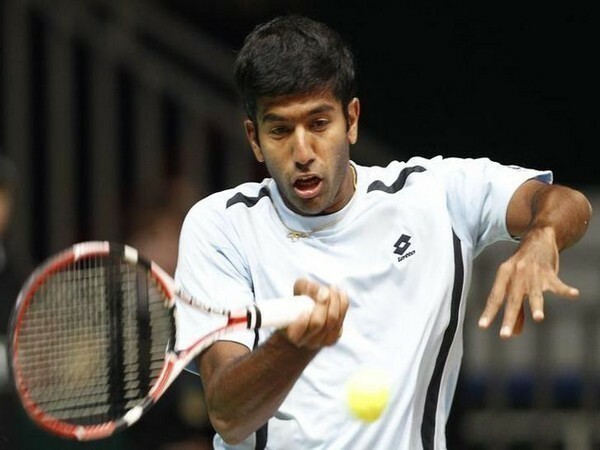 Paris [France], May 31 (ANI): Indian tennis ace Rohan Bopanna and his French partner Edouard Roger-Vasselin will look to secure their place in the pre-quarterfinals of the French Open when they play their second round of the men's doubles event here on Thursday.